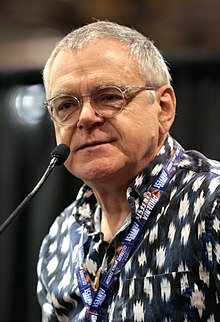 کوین مک‌نالی (اینگیلیسجه: Kevin McNally) بریتانیالی اوْیونچو. ۲۷ آوریل ۱۹۵۶ ‏ ایلینده دۆنیایا گؤز آچیب. 1976–گۆنوموز ایللر آراسیندا سینما ساحه‌سینده چالیشیب. Along with fellow British actors Ian McNeice and Kenneth Branagh, McNally appeared in two Second World War films, Valkyrie and Conspiracy, that depict behind the scenes activities of high ranking officials in نازی آلمان. Other television credits include: Z-Cars, The Bill, Casualty, The New Statesman and Murder Most Horrid. McNally also co wrote several episodes of the television series Minder and Boon in the 1980s. ↑ Filmography. An Acclamation for Kevin R. McNally (official site). آرشیولنیب اصلی نۆسخه‌دن on 1 July 2006. یوْخلانیلیب6 January 2008. ↑ Telly. An Acclamation for Kevin R. McNally (official site). آرشیولنیب اصلی نۆسخه‌دن on 1 July 2006. یوْخلانیلیب6 January 2008. ↑ STAR-STUDDED VOICE CAST UNVEILED FOR DISNEY AND SQUARE ENIX’S KINGDOM HEARTS III. Square Enix Press Center (26 September 2018). یوْخلانیلیب7 December 2018. ↑ Billington, Michael (17 August 2017). King Lear review – poverty-stricken Shakespeare puts spotlight on homeless. The Guardian. اینگیلیسجه ویکی‌پدیاسی‌نین ایشلدنلری طرفیندن یارانمیش«Kevin McNally»، مقاله‌سیندن گؤتورولوبدور. ( ۲۲ ژانویه ۲۰۱۸ تاریخینده یوْخلانیلیبدیر). قارداش پروژه‌لرده کوین مک‌نالی گؤره داها آرتیق بیلگی‌لر تاپابیلرسینیز.